About Us – Bulldog Bags, Inc. Weekend food programs for students are designed to supplement the students educational process. The link between hunger and education is undeniable. Children who go hungry are more likely to exhibit higher levels of anxiety, irritability, hyperactivity, and aggression which affect all-around school performance. 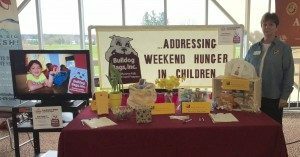 Bulldog Bags, Inc. is an all-volunteer, non-profit organization that is funded solely by donations. Food is obtained through local food drives and purchased from various low cost sources; it is packed by volunteers and delivered to the schools; the children are not known to Bulldog Bags, Inc., so the Bags are distributed to the students discreetly by school personnel, so that the recipients can remain anonymous. There are hundreds of weekend food programs feeding hundreds of thousands of children who are food insecure across the nation, including communities surrounding Stow and Munroe Falls.